Subject: Antique print, untitled. 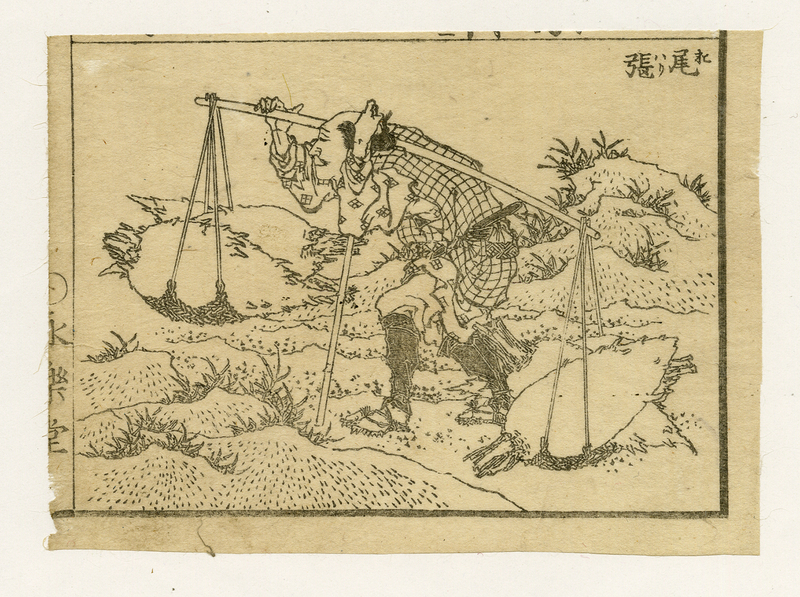 Woodblock print of a man carrying a load. Condition: Good, given age. Sheet trimmed from larger sheet. General age-related toning and/or occasional minor defects from handling. Please study scan carefully. Medium: woodblock print on laid paper. Size (in cm): The overall size is ca. 13.7 x 10 cm. The image size is ca. 12.5 x 9.2 cm. Size (in inch): The overall size is ca. 5.4 x 3.9 inch. The image size is ca. 4.9 x 3.6 inch. Description: While the general term for books written in Japan is Wahon / Wasobon, this woodblock print originates from an Ehon / E-hon (Old illustrated Japanese books.). The prints in these books are woodblock prints, similar to the separately published Japanese prints which are called Ukiyo-e (Prints of the non-eternal world.). Ehon books are often stitched in accordion folded pages. Possibly from a book with drawing examples. Age estimate: 1850.